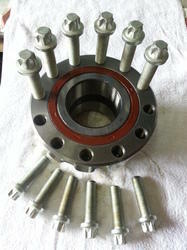 Manufacturer of a wide range of products which include wheel hub bearings and auto wheel hub bearing. The automotive bearings are used in various automobiles. 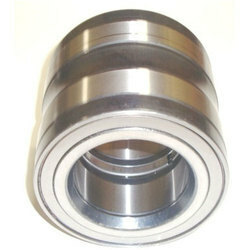 The bearings perform silently in a tough environment and provide smoothness and longevity to vehicles. These bearings help in reducing the rotational friction between the vehicles and the surface it runs on, especially on cemented roads. It supports axial and radial forces to maintain balance in the event of speed changes. These are inserted inside the wheels in a special gap called the cage. The bearing runs around the cage while the vehicle is running and function to evenly distribute the load of the vehicle. The sturdily and cautiously developed Auto Wheel Hub Bearing is superiorly used in the wheels of automobiles ensuring flawless rotation of the wheels. Our bearings are designated from premium grade materials along with the employment of sophisticated techniques in a one-piece assembly incorporating wheel bearing and hub to ensure smooth rotary function. This bearing range makes sure that the wheels, steering and braking systems move flawlessly without causing any friction and noise. Inside the wheel hubs are either roller or ball bearings that carry the vehicle's weight. On RWD vehicles with solid axles, the rear wheel bearings are mounted on the axles. The front wheel bearings on older rear-wheel drive cars and trucks usually require "repacking" (regressing) every two years or 24,000 miles. The wheel bearings on most newer vehicles are sealed and do not require any maintenance. A bad wheel bearing will typically make grinding, whining or squealing noises, and you can often feel the looseness or roughness if you raise the suspension and rotate the wheel by hand. Worn wheel bearings should be replaced, because failure may cause the wheel to come off the vehicle. Looking for Auto Wheel Hub Bearing ?